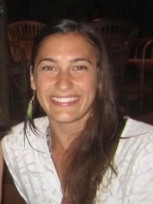 Nadia's style of teaching is fun, friendly and her students are made to feel like part of "one big yoga family". Nadia teaches in Oxford at the East Oxford Community Centre every Tuesday, alongside private classes for all levels and abilities. You can read all about her classes below along with her thoughts and impressions of the ACUYOGA Programme. How would you describe the style of yoga you teach? My foundations for teaching are based in Vinyasa. I love the breath synchronised with movements, it can almost feel like a dance. What advice would you give to someone starting yoga? Most important is to try it all! There are so many styles out there and every teacher adds something different to each. Also to be gentle on yourself to begin, you will become to know your body more than you might have before so honour what feels good in every moment. Most importantly be playful with it and have fun, who knows where it will take you. What do you love most about practising yoga? My mind is extremely active which means I get a lot done but sometimes it's exhausting. As soon as I step onto my Yoga mat there is an almost instant state of calm. I am completely connected to my body and my breath and I really feel as if I am meditating with movement. Plus the element of the flow makes me feel fluid and graceful as if part of a dance. How might a student describe you as a teacher? I really want to have a feeling of community in my classes so everyone that comes is instantly part of a family. When, where and how much are your classes? I teach at East Oxford Community Centre on Tuesdays. 7am in the Fusion Arts building and 6pm in the main hall. Open to all and £7 drop in.